Right from the start, it was clear that this show was not going to be any run-of-the-mill concert. 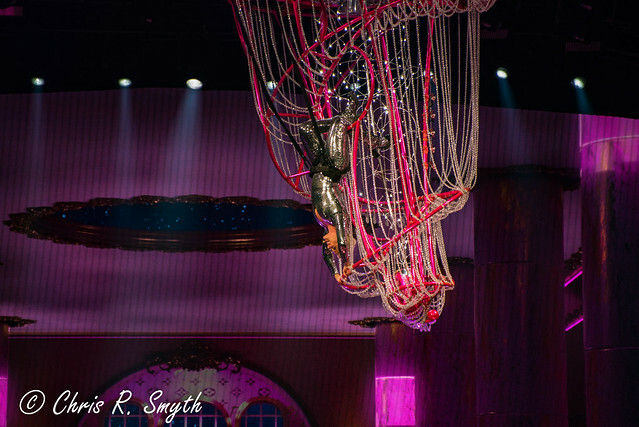 Pink started the night by entering the arena via giant pink chandelier for her first song “Get The Party Started.” There was no easing into the set — Pink, born Alecia Beth Moore, spent her time hanging from, and back-flipping off, the chandelier and flying around the stage. 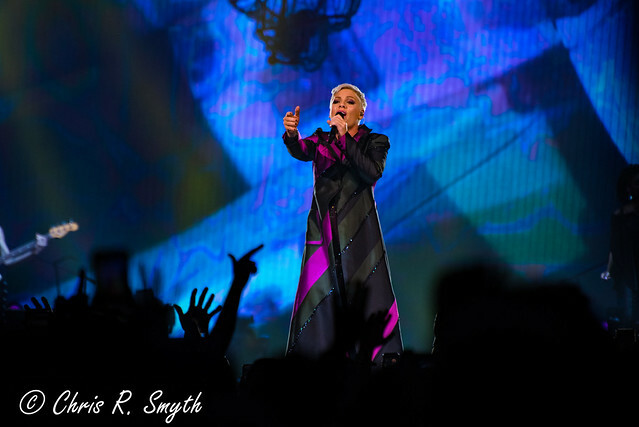 Touring in promotion of her 2017 album, Beautiful Trauma, Pink kept her feet on the ground for her second song of the night, and she went into the title track of the album. The stage included twisted, colorful light poles and other props that looked to be straight out of a Dr. Seuss book. 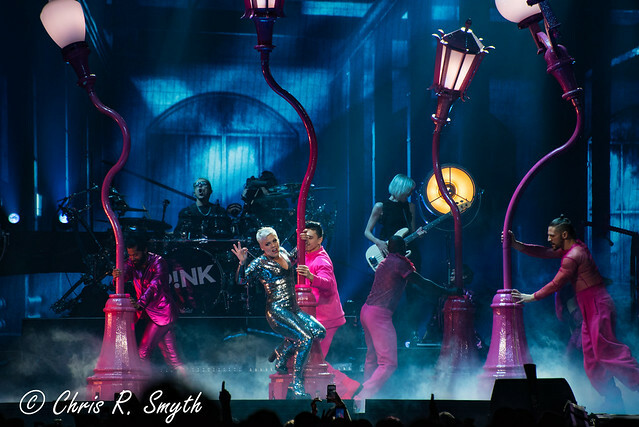 Pink then threw it back to her second album, Missundaztood, with the hit “Just Like a Pill.” Making use of the entirety of her heart-shaped stage, Pink made her way around it, high-fiving, and thanking the fans who were fortunate enough to be in the pit. Managing to still perform songs where she collaborated with other artists, Pink continued to amp up the performance level and mix in the artists who were not actually in attendance. “Revenge,” a rap-pop single off Beautiful Trauma about a couple who are cheating on each other, takes a rough subject and makes it feel like it should be a happy song based on its fun baseline reminiscent of Afroman’s “Because I Got High.” Halfway through the song, Eminem collaborates and raps the man’s revenge part of the song. In concert, this part is “rapped” by a 30-foot-tall, inflatable Eminem who gets attacked by an aerial flying Pink. With the single “Just Give Me A Reason,” a 2013 collaboration Pink did with Nate Ruess of Fun., the stage was a bedroom set. While Pink roamed the confines of her “bedroom,” Nate Ruess sang to her from a black-and-white television set beside her bed. Before starting into “Funhouse,” the distinct guitar hook of “Just A Girl” by No Doubt played. Pink shouted her love for Gwen Stefani, and this led to an unexpected mashup that combined Pink singing the No Doubt chorus with her backup singers taking the “Funhouse” chorus. The biggest surprise of the night may have come when Pink announced that “everyone can go crazy for the next four minutes,” and then the band exploded into Nirvana’s “Smells Like Teen Spirit.” Working all corners of the stage, Pink exemplified the raw emotion and power that a song of this magnitude and history requires. The final two songs of the night were about as diametrically opposite as could be. The second to last song was the 2008 massive hit, “So What.” Despite her aerial acrobatics over the stage throughout the night, Pink still had a surprise for her fans. 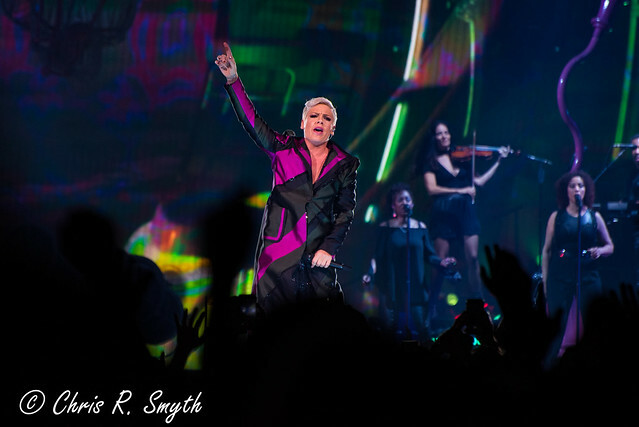 Before kicking into the last song, Pink pointed to the back of the arena and announced “I’m coming to see you!” By the time the band hit the song’s chorus, she was shot to upper deck at the back of Capitol One Arena — twisting, turning, flipping, and singing all the way there. As the song played, she crisscrossed the arena, flying just beyond everyone’s reach, but briefly giving each and every fan a front row seat of her performance. The night came to a close with “Glitter In The Air,” a soft piano-driven ballad. After the grandiosity of the entire night, this felt like a proper closing moment. Dressed in a white shirt and ripped jeans, on an all black stage and under a white spotlight, Pink sang her emotions. Despite the vastness of the arena, the simpleness of the closing number made it feel like an intimate venue. It brought everyone a little closer to each other and to the star of the night, Pink. 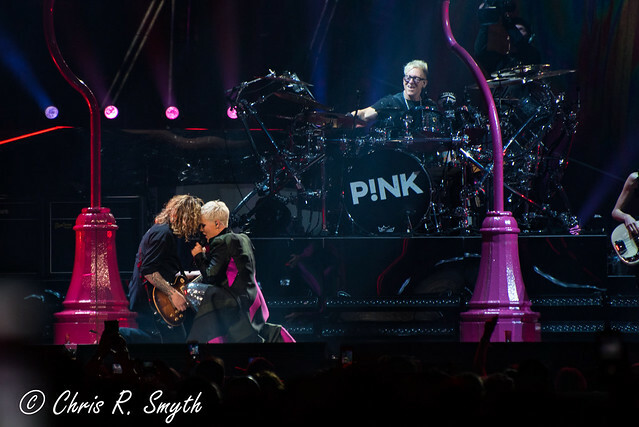 Here are some pictures of Pink performing at Capital One Arena on April 16, 2018. All photos copyright and courtesy of Chris R. Smyth.